Turbulent drag reduction by additives has long been a hot research topic. This phenomenon is inherently associated with multifold expertise. Solutions of drag-reducing additives are usually viscoelastic fluids having complicated rheological properties. Exploring the characteristics of drag-reduced turbulent flows calls for uniquely designed experimental and numerical simulation techniques and elaborate theoretical considerations. Pertinently understanding the turbulent drag reduction mechanism necessities mastering the fundamentals of turbulence and establishing a proper relationship between turbulence and the rheological properties induced by additives. Promoting the applications of the drag reduction phenomenon requires the knowledge from different fields such as chemical engineering, mechanical engineering, municipal engineering, and so on. This book gives a thorough elucidation of the turbulence characteristics and rheological behaviors, theories, special techniques and application issues for drag-reducing flows by surfactant additives based on the state-of-the-art of scientific research results through the latest experimental studies, numerical simulations and theoretical analyses. 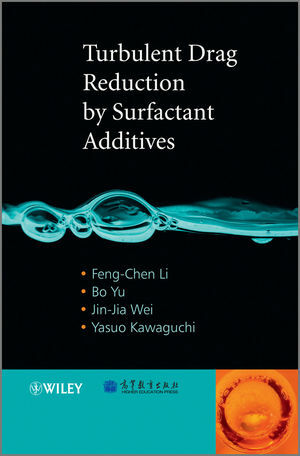 Turbulent Drag Reduction by Surfactant Additives is geared for researchers, graduate students, and engineers in the fields of Fluid Mechanics, Mechanical Engineering, Turbulence, Chemical Engineering, Municipal Engineering. Researchers and practitioners involved in the fields of Flow Control, Chemistry, Computational Fluid Dynamics, Experimental Fluid Dynamics, and Rheology will also find this book to be a much-needed reference on the topic. Feng-Chen Li, Harbin Institute of Technology, China Professor Feng-Chen Li received his Ph.D. from Kyoto University in Japan, before becoming one of the members of the turbulence control community. A number of new findings have been achieved from collaborative work with colleagues and he recently initiated a pioneering work on viscoelastic-fluid-based nanofluid. Professor Li has published over 100 publications, including book chapters, journal papers and contributions at international conferences. Bo Yu, China University of Petroleum (Beijing), China ProfessorBo Yu obtained a Ph.D. degree from Xi'an Jiaotong University. He has been a full professor of the Department of Oil & Gas Storage and Transportation of China University of Petroleum at Beijing since 2005. Hiscurrent research interests include: Turbulent Flow; Computational Fluid Dynamics; Numerical Heat Transfer; Non-Newtonian Fluid Dynamics; Long-distance Transportation Technology of Waxy Crude Oil. Having published more than 50 international journal papers, he also has many awards. Jin-Jia Wei, Professor, Xi'an Jiao Tong University, China Professor Jin-Jia WEI obtained a Ph.D. degree from Xi’an Jiaotong University in China and another Ph.D degree from Kyushu University. In 2005, he became a full professor of State Key Laboratory of Multiphase Flow in Power Engineering of Xi'an Jiaotong University. His current research interests include: Turbulent Drag Reduction by Surfactant Additives and its Applications for Practical Engineering in the District Heating/Cooling System; Particle-Fluid turbulent flows in pump and pipe system; Enhanced boiling heat transfer; Thermal utilization of solar energy; Computational fluid mechanics and Brownian dynamics simulation. He has published more than150 journal and conference papers. Yasuo Kawaguchi, Tokyo University of Science, Japan Professor Yasuo Kawaguchi obtained his Ph.D. degree from Kyoto University in Japan. In April 2005, he became a full professor of Department of Mechanical Engineering, Faculty of Science and Technology, Tokyo University of Science. His current research interests include: Turbulent Drag Reduction by Surfactant Additives and its Applications for Practical Engineering in the District Heating/Cooling System; Drag reduction of water soluble polymer and is application for economization of ship propulsion; Gas-Solid particle turbulent flows relating to environmental problem, pump and pipe system; Application of laser techniques to thermal and fluid flow. He has published more than150 journal and conference papers. Turbulent Drag Reduction by Surfactant Additives Visit the companion website to access lecture slides for instructors.